Thirteen types of seagull have been recorded on Arran. Twenty species have been recorded in Scotland. With plumage variations at different age stages and different races, seagulls can be a challenging group to identify. Let’s start with black-backed gulls. 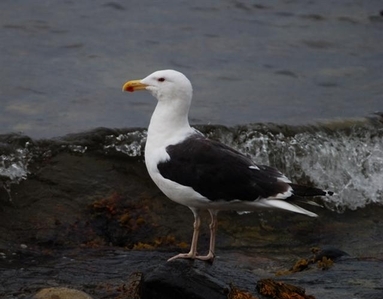 On Arran there are two gulls regularly reported that have black backs, the Great Black-backed Gull and the Lesser Black-backed Gull. How can they be told apart? The Great Black-backed Gull, as the name suggests, is the larger gull with a wing span up to 165cm. The Lesser Black-backed wing span is around 135cm. Both are omnivorous, eating a wide range of food including crustaceans, worms, starfish, fish, molluscs, eggs, scraps, offal and carrion. While the Lesser takes some small birds and mammals, the Great Black-backed Gull is a major predator and in seabird colonies takes young gulls, auks, gannets and shearwaters. Both breed on Arran. 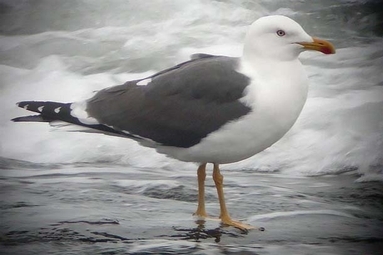 Whereas the Great Black-backed Gull is sedentary and can be seen all the year round, the Lesser is migratory and tends to move off the island from late November to early March. In recent years a few have remained in the Clyde area in the winter. This year a few were reported in late February on Arran. The peak arrival time is mid-March to early April when up to 50,000 Lesser Black-backed Gulls move into Scotland from their wintering grounds off north-western Africa and south-western Europe. Some will stay to breed in Scotland while others move on to breeding grounds further north like Iceland.